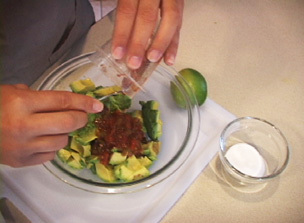 RecipeTips.com's video demonstration, 'Easy Guacamole,' gives you an easy guacamole recipe for your next gathering. Hi there! This is Laurie from RecipeTips.com. 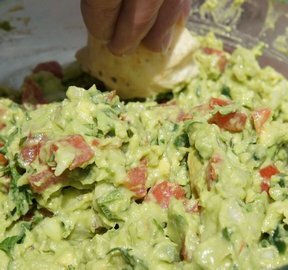 Today I am going to show you how to make a really easy guacamole. Start by slicing your avocados and removing the pit, and then just make sure you baste the avocados with some lemon juice to keep them from turning brown. A really easy way to remove the flesh of an avocado is to take a knife and just make a crisscross pattern down to the skin of the avocado; then you just take a spoon and scoop it out and put it in a bowl and it is already nice and diced. This recipe calls for three avocados and a quarter cup of salsa. Choose any kind of salsa you like and it can be however hot you like it. 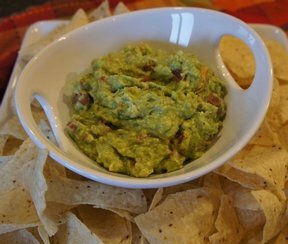 Just dump everything in on top of the avocados; and you want about a teaspoon of salt, and this can be a guesstimate: it is kind of your preference, how ever you like it. The last ingredient is one half of a fresh lime, juiced on top. Sometimes it is best to go ahead and roll the lime on a flat surface to get the juices flowing before you try to squeeze it. Using a fork, go ahead and start mashing the avocados and the rest of the ingredients. 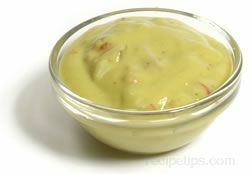 If you like a chunkier guacamole, go ahead and use a potato masher; if you like creamier guacamole, use a hand mixer. Once you get it to the desired consistency, it is ready to serve. 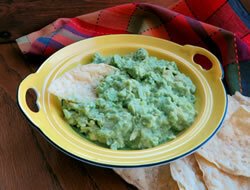 Now you can serve this with chips as an appetizer, or it is a great condiment to any of your Mexican foods. For more great recipes like this one, visit RecipeTips.com.